One would think that the information locked away in the Vatican Library only relates to Christian writings, images and information. But as the following article reveals, there is a wide range of antiquities in their store. Why would this seemingly religious organization seek to keep these records unless there was some value placed on them? Many researchers into the Occult and the hidden powers of this world eventually discovers that the Vatican or Roman Catholic Church is the nexus for ecclesiastical, legal, spiritual and science related information. Literally the whole of the western world's corporate and governmental foundations trace their origins to this incredibly secretive organization. Related Pope 'Ruler of the World' to go after War Criminals? The Library of Alexandria was burnt down during the reign of Julius Caesar, according to the mainstream academic view, shortly after one of the most tyrannical families in history took power and destroyed the Roman republic. The Roman Death Cult, as Frank O'Collins describes them, later founded one of the most destructive and draconian cultures the Earth has ever seen, which still rules the world from the shadows via obfuscated systems of power. Related Occult History and Legend of Christopher Columbus | Did The Vatican Papal Bulls Enable The Conquering Of The New World? 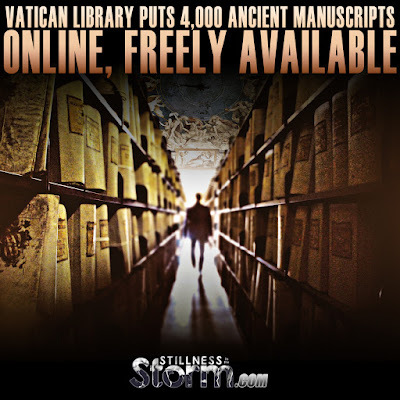 And now in this time of apocalypse, when all the deepest mysteries of our world are discussed openly on the internet, the Vatican allows 4,000 ancient manuscripts to be released for free online. What could the motivations be for this unprecedented release of data? The same information now able to be accessed at the stroke of a few keys online, was once enough to be branded a heretic. Is this a sign of the powers that be repurposing themselves for the coming age of light and life? Or is this yet one more elaborate power play to win over the waking masses? At this point we can only speculate, but one thing is assured. Our ability to seek the truth, and share it with others, will eventually ensure any illusions of freedom are seen for what they are. For in order for the truth to empower us, it must be written in our hearts and minds. not simply accepted as a matter of faith from a well intentioned priesthood or leader. In an age of deceit, the torch of freedom is lit by the inquisitiveness of the mind, made manifest through the acceptance of the heart. The Vatican Apostolic Library is now digitising its valuable ancient religious manuscripts and putting them online via its website, available for the public to view for free, as well as turning to crowdfunding to help it complete its work. The Vatican Library was founded in 1451 AD and holds over 80,000 manuscripts, prints, drawings, plates and incunabula (books printed prior to 1500 AD) written throughout history by people of different faiths from across the world. The library also includes letters from important historical figures, drawings and notes by artists and scientists such as Michelangelo and Galileo, as well as treaties from all eras in history. The ancient documents are now being preserved under the DigitaVaticana programme using FITS, the format developed by Nasa to store images, astronomical, and astrophysical data, and until now, only 500 manuscripts and 600 incunabula were available to view on the Vatican Library website. Now, the Vatican has teamed up with Japanese firm NTT Data to digitise a further 3,000 manuscripts by 2018. The manuscripts will be available as high-definition images that can be accessed using NTT Data’s AMLAD digital archive viewing technology (you can view some samples here), which can be used on a multitude of devices including tablets. Right now, users have to search the old digitised database manually by clicking on each title and scanning through all the pages in each book, but the AMLAD viewer will have a comprehensive search function built-in and ready to use by the end of 2014. The Vatican is also still seeking funds to digitise the remaining 76,000 manuscripts, which it estimates will take more than 15 years, over €50m, and the efforts of more than 150 specialised experts. In June 2014, the Vatican held a fundraising event and gave attending guests an exclusive guided tour of areas generally closed to the public, including the Library halls, laboratories and the caveau where the manuscripts are safeguarded, with dinner in the Sistine Hall. The Vatican is also turning to crowdfunding and is now seeking donations of €5 (£4, $6.38) to save a single page in a manuscript, while donations of at least €1,000 will see the backer included on the official supporters list. Companies can also choose to become a partner like NTT Data and work with the Vatican on preserving irreplaceable ancient texts. “The originals will be kept safe in temperature and humidity-controlled anti-atomic bunkers,” the Vatican writes on the DigitaVaticana website.